Twenty years ago psychic Sarah Summers fled from the evil that lurked in the woods behind her childhood home after it killed most of her family, but a nasty divorce and financial hardships forced her back when nothing else could. With her son, Jeremy, she returns to her grandmother’s dilapidated house and tries to begin a new life. She meets an eligible man, police detective, Ben, who falls for her, and she prays her fresh visions of bloodshed and death deep among the dark trees are not true. Then the murders begin again and Sarah is hurtled back into the same nightmare that has haunted her her whole life. The evil in the woods is awake again…and this time it wants her last remaining brother, her son…and her. With Ben’s and Jim’s help can she defeat it this time…and live? In author Kathryn Meyer Griffith’s novel, Evil Stalks the Night—a revised edition of the first book she ever wrote—we meet Sarah Summers and her six brothers and sister, mother and father at her childhood home in Suncrest. This is where we first learn of the evil in the woods. It all starts when Sarah is just ten-years-old. The evil stalks the family and haunts the woods in by their home; soon after the death of children in the town, and their family they are forced to flee from Suncrest for another home in fear. Years later Sarah, a physic, is now a mom to Jeremy, having just divorced and lost her job she is forced to come back to Suncrest and the home her grandmother left to her when she died, her brother coming along with her to help her move. Sarah and her brother Jim (Jimmy) are the only ones left in her family, everyone else having died of apparent accidents, but soon Sarah learns what Jim has know for some time—It killed them, all of them and has forced them to come back to where it all started so many years ago. Now trapped, her son in danger Sarah does not know what to do only that the thing in the woods has been chasing them for years and now that it has got them home—they may not get out of it alive. 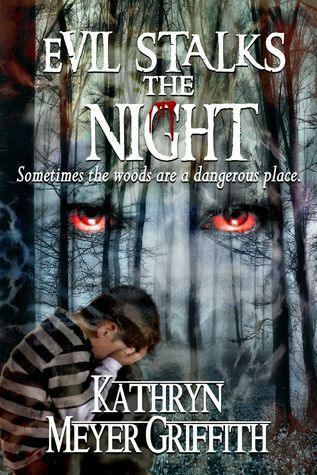 I will not be going in the woods alone anytime soon after reading this novel by Kathryn Meyer Griffith! This is the second book I have read by author and I loved it! To be quite honest it scared me! Even a few days after reading it, it is still on my mind especially late at night when the house is dark and quite. I have only read one other book besides this authors that scared me long after the fact and I have to give her kudos for that. Griffith had me on the edge of my seat in suspense, and fear but desperately reading to turn the page and find out what was going to happen next! The point of view does change through out this book, but not anything that gets hard to follow. We have Sarah’s POV, Jim’s, Jeremy’s, Ben’s and the Evil’s POV as well; which I thought was a great addition to the novel. By doing so we know a little more background and goings on that we might not have known if we did not have its POV. Besides POV change we also change time periods a couple times. Well, to be more accurate, we follow Sarah in her visions of terror about the past and the Evil. I loved all of the characters form Sarah and Jim to Charlie their evil-dead-little-brother and Ben the hunky-motorcycle-riding-cop. 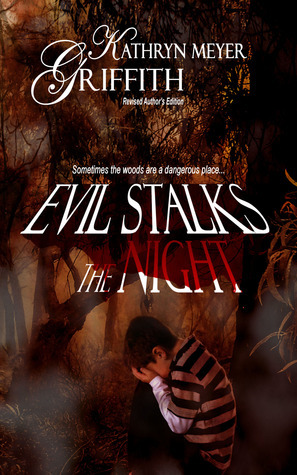 Overall Evil Stalks the Night was a fast paced and thrilling read that I would recommend to anyone looking for a great horror/thriller/suspense read. I loved he book The Last Vampire, it was in my mind long after I was done with it. I would love to read more of her books, this one is going on my list. She is an excellent writer for sure. Thanks for the great review Holly!